Sustainability is defined as an approach that meets the needs of today without affecting the ability to meet the needs of tomorrow. This is the first of four articles that will explore the issue of environmental sustainability. Of course the National Party are having a dig at the government and their climate change policies. Whether they would be any better is debatable but their statements do highlight an important question: Are sustainable practices just like putting a new lick of paint on the Titanic? In his new book, The Revenge of Gaia, the leading scientist James Lovelock makes the point that sustainable development is a contradiction in terms: a red herring expounded by government and business interests alike. He says that sustainable development could have worked if we had started many years ago but it is now too late and what he calls for is a “sustainable retreat”. The fact is that any and all efforts to be more energy and resource efficient are welcome, and they do make a difference. However Lovelock and many others believe it is just delaying the inevitable: the overheating of the earth. Lovelock is saying that the damage is done, we are ‘losing’ so-to-speak and we can’t win unless we retreat and do something completely different. He says we must stop using fossil fuels now and find alternatives. Sustainability is defined as an approach that meets the needs of today without affecting the ability to meet the needs of tomorrow. Sustainable practices (whether you want to view them as development or as retreat) fit into three interwoven strands. The first strand is efficiency – using less energy and resources to do the same thing. The second is finding and using alternatives to finite and polluting resources like coal and oil. The third strand is the offsetting (or compensating for) any pollutants, eg. greenhouse gases, that are created. This is the fundamental mechanism for sustainability but it is driven and/or affected by a number of factors including level of awareness and knowledge, social attitudes and the availability and cost of solutions. An example of how attitudes affects sustainability is the issue of nuclear energy. James Lovelock is a strong advocate of nuclear energy as a fuel source. All alternatives to fossil fuels have their pros and cons and he sees nuclear fission generators as having the best pro/con ratio; his case is compelling. New Zealand has made a stand against nuclear energy. We know that New Zealand is blessed with a large number of renewable sources of electricity – hydro, geothermal and wind make up nearly 70% of all electricity generated. However the use of fossil fuels, especially coal, for electricity generation is still growing and, as Table 1 highlights, electricity is just one fuel type used. 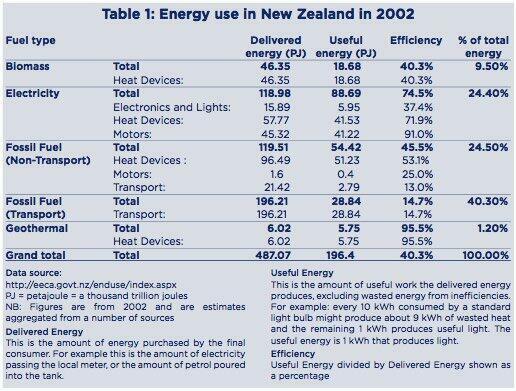 In fact electricity makes up less than 25% of the total fuel delivered in New Zealand. 65% of delivered fuel is fossil fuels which are mostly used for transport and heating devices (such as the Army’s boiler). This is an enormous amount of energy that we need to find alternatives for. To replace those fossil fuels with ‘clean’ energy eg. wind energy would mean the construction of many thousands of wind turbines. Wind might be renewable but it is fickle too whereas nuclear energy provides enormous amounts of energy at a constant rate. New Zealand is unlikely to ever have a fission generator. However in the future we may well build fusion generators. If fusion generation technology becomes viable it will eliminate all of the issues we have with a fission generator – radioactive waste and the danger of meltdown and other accidents. Table 1 also highlights the efficiency of the different types of fuels, transport fuel being the least efficient. It shows that almost 60% of delivered fuel is wasted through inefficient use. So, to be sustainable we need to become more efficient, we need to find alternatives and we need to clean-up, recycle or otherwise offset the pollution and waste that we create. 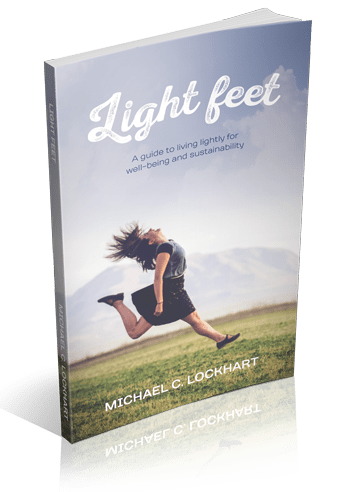 The next three articles will cover each of the three strands of sustainability.